We arrived at the bottom within twenty minutes after the most exhilarating journey of my life. Maybe the driver was on drugs or drunk, or maybe he was just your typical machismo Latin American hombre, but he floored the accelerator ALL the way down. The g-forces pinned the three of us to the metal floor and we shrieked and grinned like idiots all the way down. I was flying! I didn’t care if we flew over the abyss into the space beyond; I was completely and utterly relaxed and just wanted the driver to find more speed from somewhere. He drove aggressively and confidently, twisting the truck round the short, tight bends only slamming on the brakes at the occasional speed bump. We got out at the bottom and couldn’t believe the coincidence – he had parked bang outside the little restaurant that we had intended to try to track down for our lunch. This adrenaline ride was part way through our week long holiday which came at the end of my time at SKIP, but every day is a fantastic adventure. Following a crazy final week which ended on the Friday night with a party, plenty of dancing and some very sad goodbyes as more volunteers left, five of us set off up into the mountains on a little minibus on the Sunday morning. 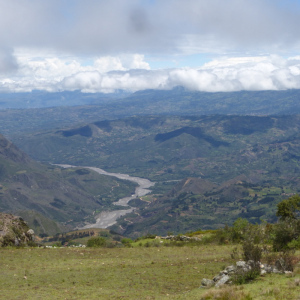 We had a four hour drive through some spectacular scenery up to the small town of Huamachuco in the Andes. 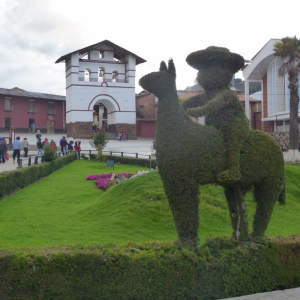 We found two rooms in a quaint little hostel right on the Plaza de Armas with its strange topiary bushes cut like rabbits, llamas and birds. 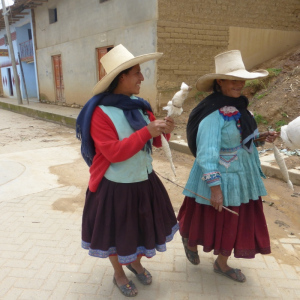 Me and my Christmas travel buddy M were joined on this trip – or for the first leg of it anyway, by another lady – K and two guys – Ky and A.
Humachuco is a small community where many of the women wear large cream coloured hats and coloured skirts over trousers. There is a feeling that nothing much has changed here for centuries and as we wandered in to the stadium to watch a local football match which was taking place, judging by the curious stares that we received, they hadn’t seen many ‘gringos’ for centuries either. The weather was noticeably chillier than the heat that we had left behind on the coast but by gum, did it rain. It hammered down in torrents, flooding the streets and the deep gutters and channels which were cut into the roadsides. Our evening meal that evening was eaten whilst we had our feet tucked up on the rungs of our chairs as water bubbled up through the floor and flooded the building. We continued to eat as the staff gamely fought a losing battle to sweep the deluge out of the door, but this was obviously just the normal routine and one of the consequences of living in the mountains. The following day I was introduced to the delights of emoliente for breakfast by K from a street trader. The vendor theatrically poured some evil smelling hot liquid from great heights between two jugs, added some stuff, stirred, poured some more and then watched as I tested it. It smelt OK and it didn’t taste too bad but had the consistency of phlegm, all gloopy and sticky. Apparently I only had to tell the vendor what ailments I had and he would mix a special potion up for me to cure all. 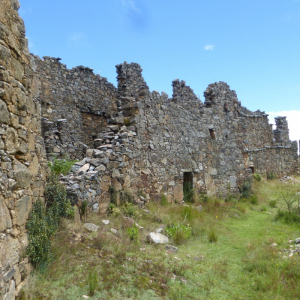 Suitably fortified, the five of us set off on what was marketed as a twenty minute hike to some ruins. 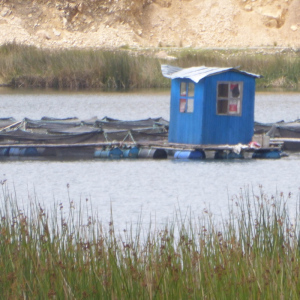 This turned out to be an hour’s trudge to some walls that were cordoned off so after watching the local miners run around a field and play football during their lunch break (complete with hard hats) we then we jumped in a combi to visit what was supposed to be a spectacular lagoon. Sat at a table by the lakeside with the cafe owner’s damp washing hanging limply above us we ate lake trout in the chill and pondered the choice of adjectives from the tourist information office. It was pretty. It was peaceful. It was decidedly not spectacular. 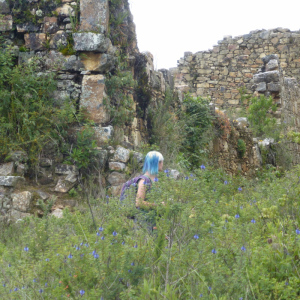 Day three and us ladies did a turn around from our choice of the thermal baths and joined the chicos on their jaunt to find some more ruins at Marcahuamachuco. Boy, were we glad that we did. A bone shaking taxi ride took us an hour deeper up into the mountains along tracks that according to the Lonely Planet should be impassable by vehicle and then we arrived at the site of Marcahuamachuca which stretched along the mountain top. The tourist information office had been very helpful and friendly but so wrong. The hike that they recommended took us twice as long and the lagoon was not exactly spectacular but these ruins, which they suggested may be worth a look if we could brave the journey, were totally awesome. Sprawling along the top of the ridge with ‘wow’ views on every side, these ruins for me, were not far short of the ones at Machu Picchu. Granted the buildings were not intact, the grass not neatly manicured and devoid of other tourists, but these things all led to the magic. Crumbling walls and secret doorways and windows were all battling against nature and the elements to remain standing proud against the skyline. 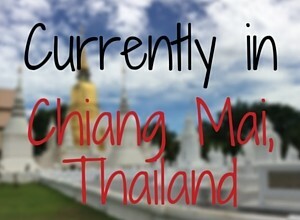 The five of us explored for a good hour before reluctantly wandering back to our waiting taxi driver. 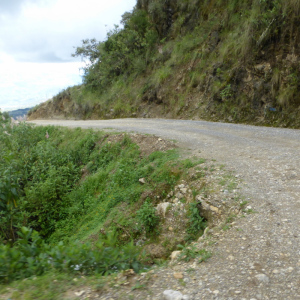 We then split up with K and A heading back to the coast and three of us moving on to the smaller town of Cajabamba a few mountain peaks to the north. I loved this place. 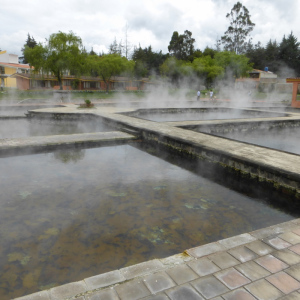 It had a real nice cosy feel and probably received even fewer visitors than Huamachuco. We initially had a VERY strange hostel here – hostel might be stretching the fact that it was a very strange room within a very strange home; but the next day we checked out and moved around the corner to a little gem of a place built around a pretty courtyard with lemon and lime trees and a very friendly owner. From here we took the combi which was mentioned at the beginning of this post up to visit the Cascadas de Cochacorral. A waterfall roared down the side of the mountain, tumbling down numerous rocky steps in a shallow valley. The walk to find it was quite long but again, we had the most spectacular scenery and we also had the place entirely to ourselves apart from the five Peruvian guys who were to give us a lift back down the mountainside later. Another long bus journey the following day took us into Cajamarca. This was the finale of our trip. It was Carnival time in South America. Cajamarca is billed as the carnival capital of Peru and we were intending to participate. Many hostels were overpriced or already fully booked but we found a room with three double beds just one street away from the Plaza de Armas. Over the course of the next few days we took local buses to visit the Ventanas de Ortuzco which are ancient tombs cut like windows into the side of a hill and the the Baños del Inca – hot thermal baths in dating from Incan times and in which an Incan King once bathed his war wounds and are now a thriving spa. 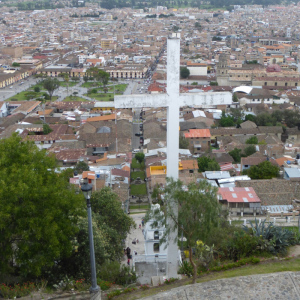 We puffed to the top of the hill for eagle eye views down over the town from the Mirador Natural Santa Apolonia and we explored the Belen complex. We became regulars at the Van Gogh art cafe and each evening sat and chatted over dinner with the Dutch owner, listened to his inebriated musician (who actually had a brilliant voice but was also determined to enjoy Carnival) and we were entertained on the guitar by Ky. Myself and M accompanied Ky and the inebriated singer on the musical eggs (think maracas). Walking back to our hostel we came across pre-Carnival Friday night in the Plaza which was a surreal experience. The Plaza was packed with little groups standing in tightly packed circles around their bottles of beer and pisco. Each group contained a drummer and most also had a trumpeter. All were beating out the same rhythmic sound and all were singing the same hypnotic song – but all at slightly different times. It was primitive, basic tribal stuff. We smuggled a couple more friends into our hostel room that night – we had large beds after all so it would have been rude not to share – and then we hit the party on the Saturday morning. It started innocently enough with little kids and their super-soakers aiming at us, but then people began dumping entire buckets of water from their balconies and groups were roaming around with buckets of paint. As far as I understand it, the groups were divided up between the barrios (gangs) from the different areas of the town. Each contained a drummer and a trumpeter or three, plenty of paint, much booze and they danced and sang their way around the streets. 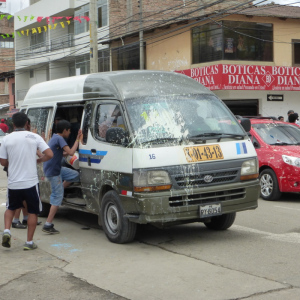 Every so often, they would stop below a balcony and loud chants of ‘Agua, agua’ would go up until the occupants obliged with buckets of water which were poured down – only to receive a barrage of paint sprayed straight back up at them, Not a car, bus or motorbike remained untouched by paint and then the groups danced off to the stadium for free food. We ended up dancing along with the barrio from Combe Mayo who were thrilled that we had decided to pick them and we were treated like celebrities, given free drinks and we were whirled around wildly to the music. It was odd coming back to earth after the wildness of the day but very funny when after showering for at least ten minutes each, we all discovered that the green paint was not to be shifted! Thank you so much for all of your encouraging comments. As a writer you will know how hard it is to be happy with your work before you press ‘publish’ and I am never too sure that my posts convey what I want to say. 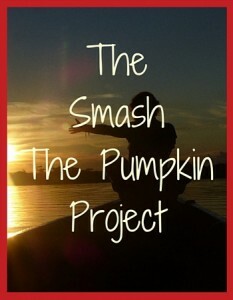 I want to cram so much in, but I could have described even more the blast down the mountain.